We present our Final Report about the Metro Manila Film Festival 2017. Note: We recommend reading this article on a laptop. This Report aims to provide a clear view of the film screening distribution during the 2017 Metro Manila Film Festival. It will also shed light on how Theater Chains treat films during the festival. We will first explain how we created the database used for this report. After that we will introduce the MMFF to those not familiarized with it. Then we will present our data with different charts and graphics. A more detail report about Ang Larawan’s journey though the festival will be presented with this report. Our aim is to be as neutral and objective as we can, presenting data as we found it. To close our report we will give our observations and conclusions. We hope this Report is of interest to the MMFF, Filmmakers, and Producers to make the necessary adjustments to improve the festival. Thanks for your time. The research covered 167 Venues nationwide, 65 from the National Capital Region (NCR) and 102 from in the rest of the Provinces (List of the venues can be seen HERE). Data was gathered from ClickTheCity.com and Theater Chain Official Websites from December 25th, 2017 to January 7th, 2018. ClickTheCity.com daily schedule for each Venue was screenshot and saved in a PDF as a backup. The time of data recollection was from 10 pm until 12 pm (Manila Time). Daily data was transferred into an Excel File for further analysis. We published the stats for each day in our website. We recomend reading this report on a laptop. The Metro Manila Film Festival (MMFF), created in 1975, is an annual event held across the Philippines during the last week of December and the first week January. It is organized by the Metropolitan Manila Development Authority (MMDA). During the festival Cinemas are obligated to screen only those films which have been approved by the Jurors of the MMFF. No foreign films can be shown except in 3D and IMAX theaters. The MMFF Executive Committee chooses 8 films to be screened at the festival. One of the festival highlights is a parade of floats the day before the festivals starts. Usually the Parade is held in Manila but this year it was held in Muntinlupa to celebrate the centennial of the city’s founding as a Municipality. During the launch ceremony held on March 7th, 2017 the MMFF Executive Committee (ExeCom) announced some changes. The ExeCom would now include more sectors from the cinema industry – professionals’ representatives from the academe, government, media and private sector. They removed Moira Lang (Scriptwriter), Ed Cabangot (Academe) and replace them with Rickly Lee and Rolando Tolentino. They also added representatives of the heater Chains; Edgar Tejerero (from SM Lifestyle Entertainment Inc.), Rolando Duenas (General Manager from Ayala Mall Cinemas), Christina Caparas (General Manager of the Vista Mall Cinemas), and Evylene Advincula (Operation Manager for Robinsons Movieworld). Vilma Santos (Batangas Congresswoman) and Laarni Cayetano (Mayor of Taguig City) were also added to the ExeCom. This year ExeCom had 25 members. The MMFF also reinstalled movie script submissions, something that was taken from the 2016 edition. Erik Matti who was very critical of the MMFF stated: “[Only accepting finished films as entries] helps the industry. Because that’s the only way you can judge a film. When it’s just a script, it leaves your work open to interpretation. What you like on paper may not be the same when it’s shot. A film can only be judged when you see a film, not the script.” – MMFF reinstates movie script submissions for 2017 entries. (2017, May 8th). Spot PH. Another big change was the criteria used in determining the final 8 entries. Commercial appeal or viability represented 40% of the criteria, Artistic Excellence 40%, Filipino Cultural and/or historical value 10%, and Global Appeal 10%. The ExeCom was criticized for these changes as people believe that this was made to accommodate big mainstream studios that were ousted last year. On July 1st 2017, when the first four films were announced Ricky Lee, Rolando Tolentino and Kara Magsanoc-Alikpala resigned the ExeCom due to failure to continue the reforms that occurred last edition. A join statement explained that they did not agree on the ExeCom and criticized them for “putting too much emphasis on commercial over art”. Some days later Ed Lejano also resigned the ExeCom. On September 1st (2017) the MMFF presented the 8 short films that would accompany the Feature films in each screening. Then on November 17th, 2017 the festival presented the last four films to the public. The Awards Night took place on the 3rd night (December 27th) two days earlier compared to the 2016 edition. During the 14 days that the festival run, there were a total of 50,381 screenings. Almost 43% of them were held in the NCR Region (21,493 screenings) and the rest throughout the Provinces (28,888 screenings). As expected SM Cinemas, which has more venues than any other Cinema Chains, was on top of the chart with 18,733 screenings nationwide (37.18 %). The movie with more screenings was Gandarrapiddo: The Revenger Squad with 15,046 screenings nationwide (29.86 %); 5,497 in the NCR Region and 9,549 throughout the country. And the least screened movie was Deadma Walking with only 3,180 screenings nationwide (6.31 %). 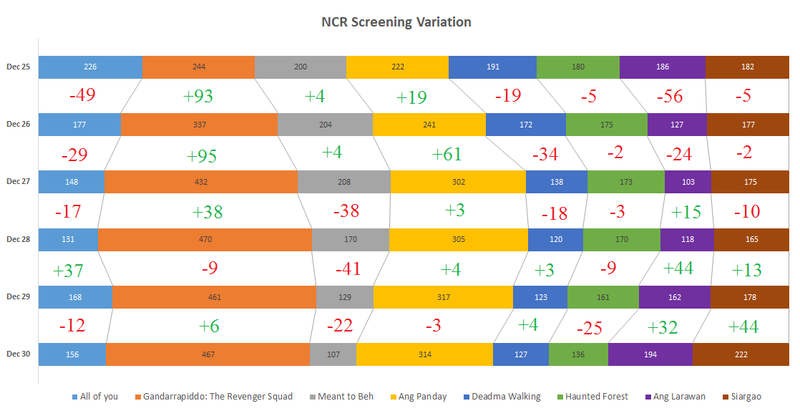 The screening distribution nationwide shows that Gandarrapiddo: The Revenger Squad lead the chart with almost 30% of the screenings, as expected the movie also lead in the NCR Region and the Province. One thing worth mentioning is that the two least screened movies Ang Larawan and Deadma Walking had a stronger presence in the NCR Region and not in the Province (they are at the bottom of the list). 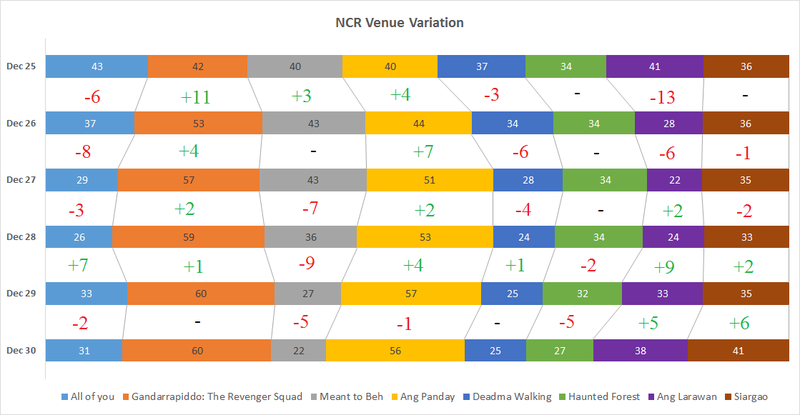 On the other hand movies like Haunted Forest and Meant to Beh who both finished in the middle of the chart (nationwide), were the least screened movies in the NCR Region. Important note: you can see a huge decrease in the number of screenings in Dec. 31st and Jan. 1st. This is due to the fact that on Dec. 31st many Cinemas close their venues earlier due to New Year’s Eve and on Jan. 1st, SM Cinemas theaters didn’t operated. Looking at the charts above we can say that in the first part of the festival (from Dec. 25th – Dec 31st) Theater Chains tried to accommodate their screening schedule to fit movies that had better performance at the box office. We can also see a decrease in the screenings for Ang Larawan and Deadma Walking, who were reported to be pull-out from Cinemas in the first days. Ang Larawan lost 18 venues nationwide in the second day and 6 in the third day. On the other hand Deadma Walking lost 13 in the second day and 7 in the third day. These movies would eventually brought back to the cinemas after the Awards Night on December 27th. We should also mention that the big variation of these movies was not in the Province but in the NCR Region. On the second part of the festival (from Jan. 2nd – Jan. 7th) data shows that there weren’t big variations in the distribution. The exception of the festival was Siargao who’s screenings increase after January 1st and place them into the 3rd place. Important note: We group screenings by Theatre Chain. We consider six main Theatre Chains and the rest of the cinemas were grouped together under “Others”. Important note: We grouped screenings by Theatre Chain. We consider six main Theatre Chains and the rest of the Theaters were grouped together under “Others”. Looking at the data above we can see how each cinema distributed their screening time to each film (Nationwide). One thing to remark is that Megaworld Lifestyle Mall Cinemas only gave Meant to Beh 27 screenings during the whole festival. The positions of the official Box Office report, released on January 8th (2018) by the ExeCom, matches our Screening Distribution rank. On the top we have Gandarrapiddo: The Revenger Squad with PHP 540 million, who become the Top Box Office Scored in Filipino Cinema history. As expected the least box office scorer was Deadma Walking with PHP 26 Million. Overall the MMFF 2017 exceeded the 1.02 Billion mark. From the charts above we can say that movies such as All for You, Ang Larawan and Siargao suffered a pull-out from cinemas in the first three days. On the other hand movies such as Gandarrapiddo: The Revenger Squad and Ang Panday continue to increase their screening number as well as the venue designation within Metro Manila. One last thing to remark is that Meant to Beh shown a decrease of 50% both in screenings and venues from Dec. 25th to Dec. 30th. Going from 200 screenings and 40 venues in the first day to only 107 screenings and 22 venues on December 30th. On the positive side we can say that after the Awards Night (on December 27th), Ang Larawan and Siargao shown an increase in their screening number as well as the cinema designation. Further analysis about this movies will be detain in the next section. Ang Larawan (The Portrait) directed by Loy Arcenas had 3,274 screenings (6.5% of the total) nationwide thought-out the MMFF. The film that was first premiere on October 30th (2017) at the 30th Tokyo International Film Festival, was able to win 6 Awards at the MMFF for Best Picture, Best Actress, Special Jury Prize, Best Music Score, Best Production Design and got the Gatpuno Antonio J. Villegas Cultural Award. But it wasn’t an easy journey for the movie. As we reported on December 27th, 2017 the film was pull from several venues. On an interview with DZMM (Dec. 26), Noel Ferrer MMFF Spokeperson said that this was a joint consent between Producers and Theater Owners due to the fact that the Box Office on the first day wasn’t that good in some areas. Cinemas agreed to increase the screening numbers after January 1st. Important note: on Dec. 30 and Jan. 1 many cinemas didn’t operate, that’s the reason for the big drop in screenings. Our data shows that the film opened with 186 screenings (on 41 venues) in the NCR. On the second day (Dec. 26) the film was dropped to 127 screenings (on 28 venues) and on the third day numbers continue to decline leaving the film with only 103 screenings (on 22 venues). It wasn’t after the Awards Night that Cinemas started to show this film again. We wanted to see what happened in the first days with the movie so we plot our data into a map and we came up with a venue distribution map. From the image we can see that on the 3rd day there were areas without any screening. They complete removed the film from Manila, Malabon, Parañaque, Las Piñas and in Muntinlupa only two venues screened the film. On the other hand screenings in Makati, Mandalyong, Pasig and South of Quezon City didn’t suffered modifications. From the chart above we can see that all Theater Chains decreased the number of screenings in the first three days. Only Ayala Mall Cinemas and Megaworld Lifestyle Malls Cinemas continued reducing screenings. SM Cinema having the most venues in Metro Manila quickly increased the screenings after December 27th. During the past few days we have been in conversation with many filmmakers, producers and actors with the objective of understanding the statistics behind the Metro Manila Film Festival. We can finally say that this is a very unique and complex festival, which requires not only stats information but also some basic socio-economical comprehension of the Cinemas in the Philippines. As someone pointed us out, we must see this stats in the proper context. And to do that we must talk about the time where the MMFF takes place, the characteristics of the Filipino Audience and the power of the Shopping Malls over the Cinema Theaters. The Metro Manila Film Festival takes place during the holidays (Christmas and New Year), when many Filipinos go back to their provinces to celebrate with their families, and some OFW (Overseas Filipino Workers) go back home with some money they have managed to save to spend with their loved ones. This makes a perfect combination for people to flock the cinemas to enjoy the latest Filipino movies specially the commercial ones. We might not enjoy Vice Ganda (Filipino Entertainer) movies but we have to recognize that people love his movies, and each year his films break Box Office milestones. And this year was not the exception. But where are Filipinos going to see the movies? Different to other countries where cinemas are located on the streets, in the Philippines most of the cinemas are located inside the Shopping Malls and are manage by them. This means the audience are in the vast majority middle class Shoppers and Students who attend Malls. People who can actually watch and re-watch films paying for each ticket around 300 Pesos (6 US$). This also means that Mall Owners see Cinemas Theaters as a commodity. So if a film is not doing well they will take it out of the Billboard and replace it with another movie that is attracting more people. And here we wants to be fair, no one with a business want to lose money, because showing a movie for only ten persons is not “good business”. But here we must rise our first flag against the Mall Owners. This is not like any time in the year were “commercial liability” rule over the film distribution, here we are talking about the biggest Film Festival in the Country. Pull-outs when a movie didn’t sell well after one day are unacceptable. It’s not the first time Cinema Owners do this during the MMFF and this year there were three movies (Ang Larawan, All of You, and Deadma Walking) pulled out from billboards in the first three days while other commercial movies were boosted and given more screen quota. And here is where we would like to question the MMFF power over the cinemas and who are running the Festival. While the Noel Ferrer, MMFF Spokesperson, announced in his Instagram account that Theater representatives agreed not to release box office figures so as not to create a bandwagon effect on the views, and encourage people to support ALL the eight entries, but on paper things were completely different. Cinema Owners were pulling movies from cinemas. We think this is a total contradiction: shows a lack of respect towards the filmmakers & producers, and underestimate the Audience. We strongly disagree that showing Box Office numbers will flock cinemas more than actually pull out movies from cinemas. We also doubt the MMFF have “encouraged people to support all movies”, we have data showing that the MMFF social media accounts have in fact posted and tweeted nothing about the movies during the festival. The social media presence of this year is appalling to say the least, even in their official Facebook Page they didn’t even mention who won the awards. We really wonder about the power of the festivals organizers over the Cinema owners. And who is driving the “jeepney”. We also question the mindset of the festival when it comes to milestones. We cover more than 200 film festivals, some very small and independent others big and recognized by the FIAPF, but we never saw a festival that cares so much about the box office as the MMFF. We would like to see a festival that thanks the audience not for their money but give more information about how many people have attended the festival. To finish our report we would like to offer our humble suggestions on how to improve the MMFF. – We strongly believe the MMFF should be in the hands of the Film Development Council of the Philippines instead of the Metropolitan Manila Development Authority. – Re impose the “Only finish films” rule for Submissions. – Increase the number of Short Films, inviting filmmakers from the province to participate. – Implement a “3 Day Lockdown” to assure the screening and don’t let Cinema Theaters to pull out films from Cinemas. Make sure Cinema Owners are commented partners towards promoting Filipino Cinema. – Have Festival Programmers to coordinate with Cinema Owners to achieve the best distribution of films across Metro Manila. – Improve online presence and promotion of the Festival & Films via their social media accounts. You can have some Live videos interviewing Directors, Actors, Producers and common Cinemagoers. Live Q&A with the audience, Workshops and Special Talks. Have Province Tours for each film crew to engage the audience and promote Local films. – Update the Official website that was never touch since 2016. – Stand for what the festival is supposed to do: Celebrate Filipino Artistic Excellence, promote audience development, champion sustainability of the Film Industry, develop and encourage the production of quality Filipino films, and promote the welfare of its workers. We strongly believe this can be implemented if there is political commitment between all the parties involved. We invite people to talk about this matter enriching the conversation. We hope we can see big & deep changes for the next edition.